The RSC once again proves that Quentin Tarantino aint got nothin’ on good ol’ Bill Shakespeare with this gloriously gruesome production of Titus Andronicus, first seen at Stratford earlier this year and now playing at the Barbican until 17th January. For those Scrooges among us, Titus Andronicus is truly the antithesis to the seasonal festivities as gleeful gore replaces glitter and garlands. The titular Titus is the badass general in the triumphant Roman army. Returning from a long battle against the Goths and with their Queen Tamora and her delightful (!) sons in tow, Titus kicks off the action by sacrificing the Queen’s oldest son to avenge the deaths of his own sons during the war. What follows is a cycle of revenge and pettiness that spirals out of control with the hands of Aaron the Moor (a wicked performance from Stefan Adegbola) firmly on the wheel. 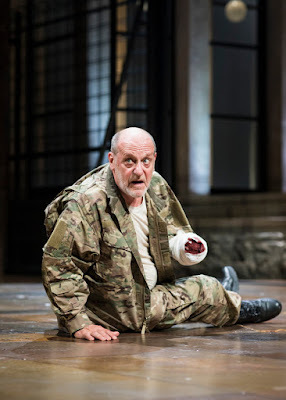 Headed up with an engaging performance from RSC stalwart David Troughton as the frail but somehow still intimidating Titus Andronicus, the play is quite the ride with humour kept firmly at the forefront even as Titus finds himself losing a limb, very slowly. 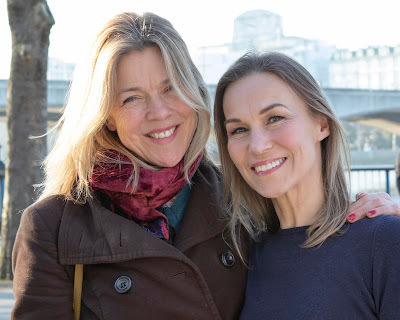 This clever offset of what is Shakespeare’s most bloody and brutal play keeps things as light as they can be, difficult for a three hour production. A spurned-love opening moment sees Tamora (Nia Gwynne) elevated to Empress of Rome opposite the newly installed Saturninus (Martin Hutson portraying wonderful ignorance) shortly after her son’s sacrifice. Not unreasonably, she bears nothing but terrible intentions and the illustrious Gwynne relishes every minute. Brothers Goth are certainly grim, inspired by their mother’s thirst for vengeance and violence, and almost childish in their pursuit and destruction of Titus’ only daughter Lavinia. Portrayed by Luke MacGregor and Sean Hart as brothers too in love with each other (at the moment platonically) to ever have a meaningful relationship outside their twosome, the actors have fun with the absolute wretchedness of their characters and bounce off each other, sometimes quite literally, with ease. Marcus (Patrick Drury) heads up what is left of the Andronicus clan with Titus, together with Lucius (the stunning Tom McCall) and Lavinia (Hannah Morrish) who, putting it lightly, suffers a pretty terrible time. This clever quartet are certainly there to be rooted for as the idiots that surround them come crumbling down. There were a couple of prop mishaps (the bloodiest Shakespeare was a little bloodless at times) that kept the play from being as flawless as other RSC productions. Though backed by the simple fortress set - designed by Robert Innes Hopkins - with many trap doors in which deaths, baths and burials can occur and combined with Blanche McIntyre’s grand and generous direction, the company depicts the tragedy of Titus Andronicus with a chorus of orchestrated bloody chaos that is breathtaking to behold.